I have some minor inaccuracies in the statistics. Nothing I can't resolve. 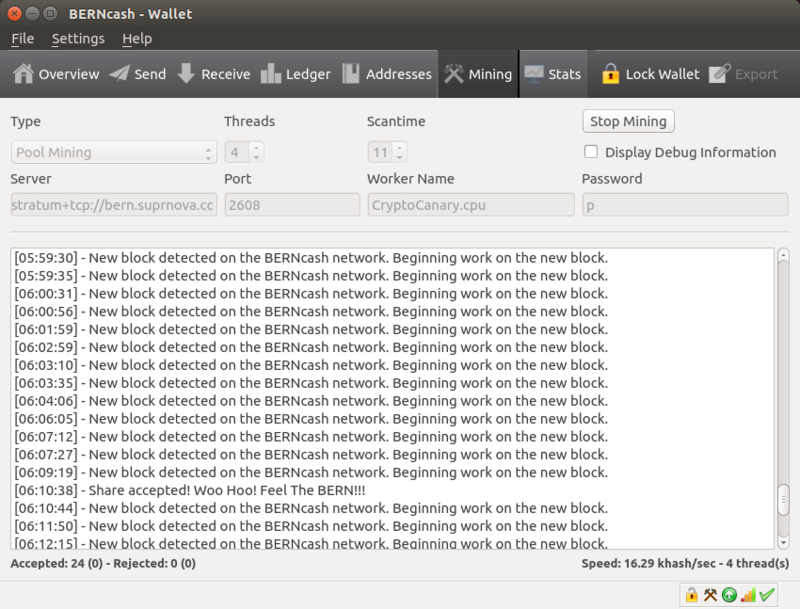 The biggest improvement to the in-wallet mining you can't see in the above picture. It is something that will seriously be a major improvement and I am very proud to be implementing. I can't spill the beans on that just yet. Much work remains, as I do have a few other enchantments and some polishing does remain on the mentioned ones, but the new wallet will be very robust. I think you all will like it, as will new BERN users. No ETA yet. I am still waiting for results from a graphic artist. Those results may or may not be implemented. Once I have the code ready I will have to compile for Windows and Mac. If there is anything you would like to see added to the wallet, please do not hesitate! Can not wait for new wallet! Here we go, fixed the status bar not being black. Small typo in the styling caused it to be white in the previous screenshots. 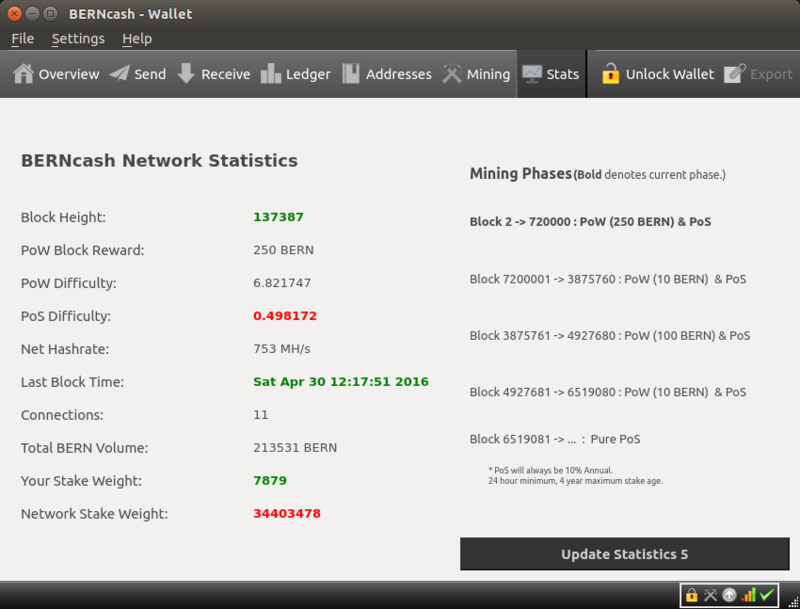 I am not happy with how the PoW mining icon looks on black. It is not terrible in this screenshot but, it is worse when mining is active. The icon is dark and not very visible against the black status bar. I will improve it. Get out "MS Paint" and play graphic artist. I also indented the "Mining Phases" over less then they were previously. 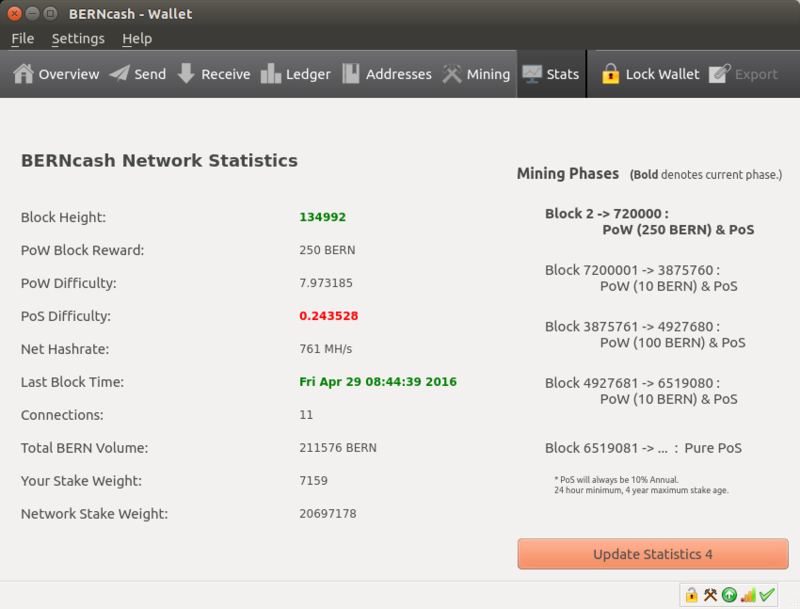 Perhaps I should just keep it aligned left to the header as is the info under the other "BERNcash Network Statistics" column of info. Always open to suggestions! p.s. If you don't know or realize, the number "5" on the "Update Statistics" button is from a timer. It counts down 10 seconds and updates. Or you can click it if 10 seconds seems too long. Also, values in the left column will highlight when they change. Green indicates an increase, red a decrease. 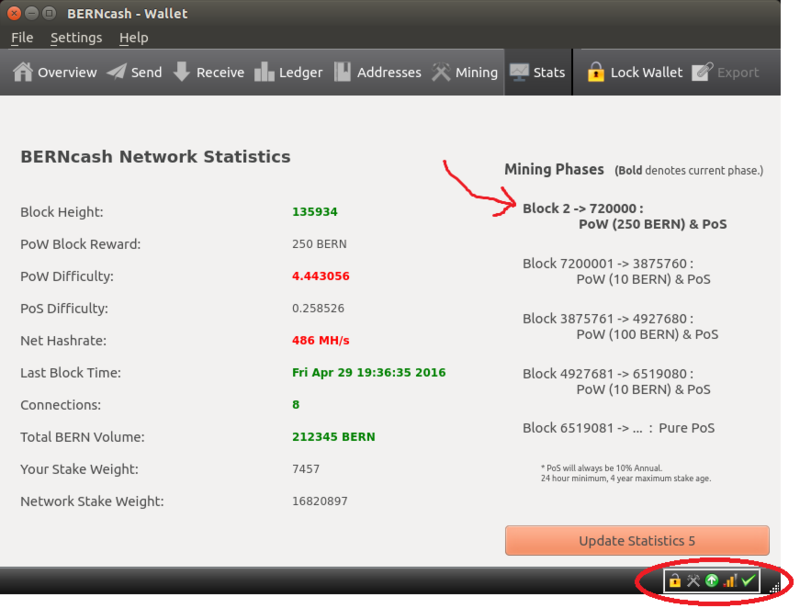 The mining phases will programmatically change the phase that is bold'ed as the chain progresses. Oh yea, fyi, the "Update Statistics" button is not going to be pink. lol, I haven't flaked out on you guys. Thanks Bigs!! A little encouragement goes a long way, and I thank you for that! I hate how the phases use so much horizontal real estate. In my previous pictures you will see that is why I used two lines to describe the phases but, I am not sure that does not confuse some also. Perhaps this way is better. I was thinking I could fill some of the vertical gaps of the phases with smaller font sized, yet bold if applicable, "real world" time projections of the phases. p.s. The pink tint on the "Update Statistics" button is because it has focus in my linux build environment. You would not see this on Windows or Mac. It is now black with a font color to match the top menu. I have been saying "no ETA" but, I am aiming for about week, ball park. Some new dependencies are in play and that can sometimes be a nightmare on Windows and Mac. There is one request from the community I have yet implemented for an audible signal of incoming transactions. Of course this will need to be mutable and probably should default to mute. There are a couple other things up my sleeve that are not completed and have not been announced. But I m working very diligently to get it out ASAP. Not having the deadline of launch always puts me in a position to fine-tweak a lot. Sometimes, perhaps an over abundance. ... font size adjustments. 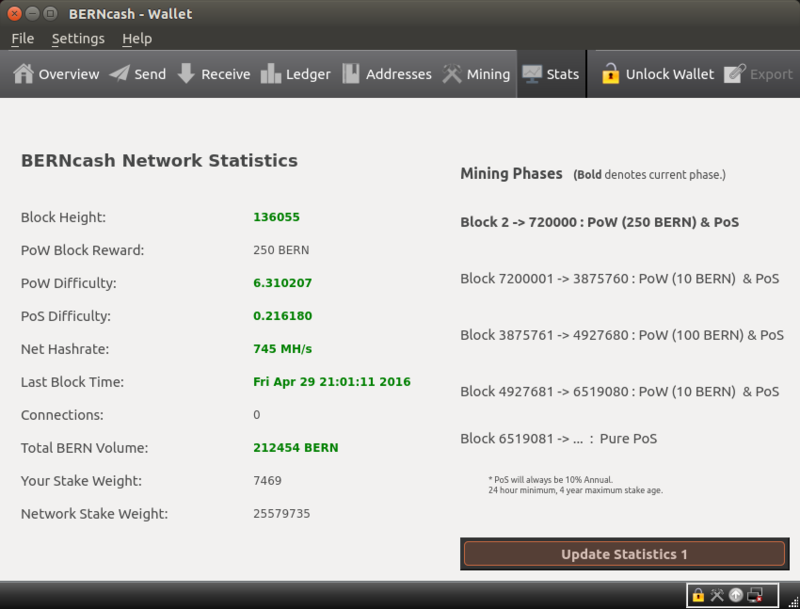 You will notice the staking weights are 'calibrating' now. They will do so every 10 seconds or as fast as you click the button. This specifically was requested and is as "real-time" as possible without some substantial overhead. Looks great, can't wait for it! Ordered my new laptop yesterday, should be here in time to get the wallet. Yesssss! I sure did see the action today and I must say I'm feeling excited about it. Finally made a bit of profit on another coin and bought more bern. Just have to get the wallet when I get the new laptop next week. I have a chromebook and can't open .zip files. Restricted by google chrome tut tut!